Here’s my cover of “Green Onion” (Booker T. & the M.G.’s). It was recorded more than 10 years ago. My role in this blues band was rhythm guitar & second solo. One of the most important thing to live a happy life is music. There are so many ways to enjoy a variety of music but I love playing an instrument as much as I listen to music. And yes, I bloody love the guitar. I’ve been playing the guitar for more 15 years. 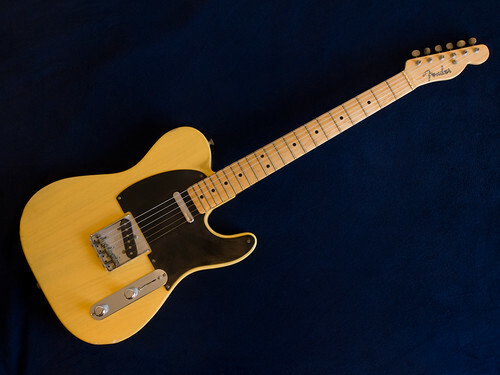 My no.1 is Fender Telecaster(photo above). And I’m a blues guitarist who adore the genuine bluesmen like Hound Dog Taylor, Albert Collins, Freddie King, Magic Sam, Albert King, James Cotton, Carlos Johnson and so on. When I recorded this tune I just wanted to play like Brewer Phillips from The House Rockers. I always listen to many kinds of music and I especially like Deep Funk these days. But when I pick my Tele, I still want to be a bluesman. I got the blues and it will never die!!! Anyway, please give me a feedback about my play!!! Thank you.